SHERIDAN AR -- Groundhog Day, which is Friday, is the Kim Kardashian of holidays. It’s only a holiday because someone decided to make it one. Nothing important ever happened on February 2, and probably never will. It does no one any good, and in fact shouldn’t even be a holiday, and if it disappeared from the calendar, no one would notice, or care. For someone like me, with a blasé attitude toward rules and a tendency to forget important dates, Groundhog Day is just about as good as it gets. 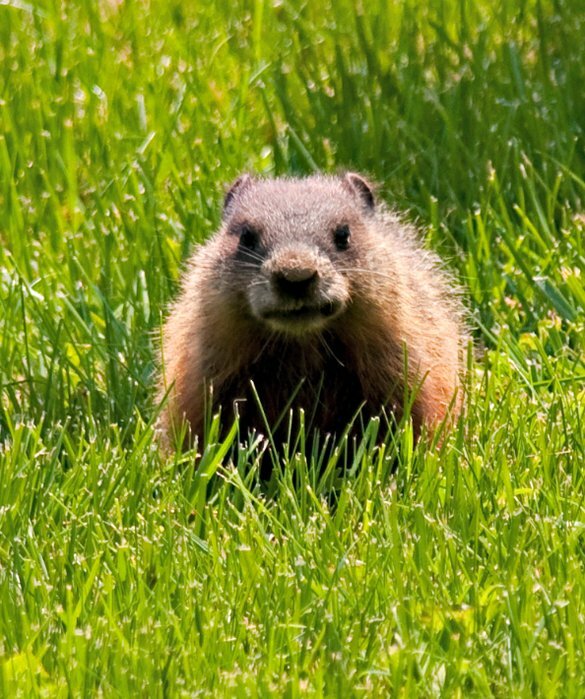 Groundhog Day started back in the 1800’s, way up in the northeast, among German settlers in Pennsylvania. The winters up there are pretty rough, involving snow and ice and pilgrims and other cold objects, and people had to stay inside to keep from freezing to death. By the end of January most folks were so sick of staring at each other and eating bratwurst they would have used just about any excuse to get outside. A good example of this is the annual New Year’s Dip at Lake George, New York. Gretchen Holzhauer, my librarian friend, once sent me a newspaper article from the Post Star about this tradition. A bunch of people go to Shepard Park Beach, Lake George on 1 January every year and strip down to swimming attire, such as you would wear if you were at Miami Beach and you looked like Brad Pitt or Pam Anderson depending on your preferred gender. Then they stick their toes in the water, shiver, put their clothes back on, and go home. Well, that’s what they would do if their brains hadn’t been damaged by frostbite. What they really do is jump in the lake, which contains water that is about minus 400 degrees. All of them immediately die. OK, they don’t die. They splash around for a while and get out of the water, looking like they jumped into blue paint instead. About 850 of them do The Dip every year. One guy, a fellow named Rick Koke, was asked how he can stand the cold. He said, “We don’t think about that. We think how much fun it is. We’re at the Beach!” It’s no wonder the Yankees were able to justify the War of Northern Aggression (1861-present). Candlemas was celebrated on 2 February, and one year, as a group of German farmers and their families were on their way to church, they noticed a ground hog sticking his head out of his burrow. They immediately beat the critter to death with sticks, and a tradition was born. the animal rights group that’s opposed to mistreatment of animals, unless they’re the ones doing the mistreating. Now we just wait to see if the groundhog sees its shadow when it comes out of its hole. If it does we get six more weeks of irritating political rhetoric on television. The fact is, ground hogs are no better at predicting the weather than most meteorologists. They’re animals, for goodness sake. And let’s be honest – if you woke up after sleeping all winter, looked out your front door, and saw that it was still below freezing outside (we’re talking Punxatauny, Pennsylvania, here), you would go back to bed for six more weeks, too. Groundhogs may be animals, but they’re not stupid. We don’t even have groundhogs in Texas, so the whole thing wouldn’t work here, anyway. We have rattlesnakes, but nobody wants to stand around outside a snake den and see if a rattlesnake thinks winter is over. We’re Texans, but we’re not stupid. What we do down here is watch the mesquite trees. When the mesquites bud out, it’s spring. Not before. Once in a while the mesquites will get fooled, and we’ll have one more freeze after they sprout, but that doesn’t happen often. So I guess you could say the trees in Texas are smarter than the animals in Pennsylvania, which means the vegetarians are actually eating the more intelligent life forms. Tell that to the next animal rights activist you run into. Plus – and you can take this to the bank – you will never, ever, see a mesquite tree jump into Lake George on New Year’s Day . . .